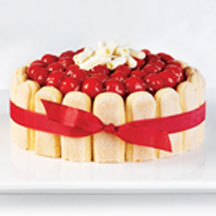 This classic dessert—reinvented for busy bakers—combines the rich flavors of chocolate, coffee and cherry with ladyfingers and whipped cream. Line sides and bottom of an 8-inch springform pan with lady fingers. Combine gelatin and water; set aside. In medium saucepan combine chocolate pudding and milk. Stir constantly over medium heat until pudding comes to a full boil; remove from heat. Stir in gelatin and coffee; cool. In large mixing bowl, whip cream. Fold in cooled pudding and 1 cup cherry fruit filling. Spoon into springform pan and freeze 3 hours. Remove sides of pan and top with remainder of cherry fruit filling. Tip: Garnish with chocolate curls if desired. Recipe and photograph provided courtesy of Comstock® Wilderness®, through ECES, Inc., Electronic Color Editorial Services.